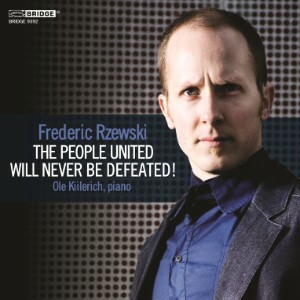 Frederic Rzewski’s The People United Will Never Be Defeated! is a modern classic in every sense. In the almost 40 years since its premiere, this mammoth variation cycle has more than vindicated its composer’s ambitious goals. He set out to write a companion piece to the Diabelli Variations and succeeded in creating a work capable of standing comparison, not only with that, but also with the Goldberg Variations too. Between them, the three sets chart the history of the keyboard variation form, each the iconic work in the medium for its respective century. The discography that The People United has amassed is as good an indicator of its status as any. Leading pianists of successive generations have been drawn to it, and competition in the catalogue is fierce. Ursula Oppens, who premiered the cycle, recorded it in 1979 and the disc went on to win a Grammy. The composer himself has also performed it widely, and a video of one of his recent performances is among the competition. But, as with any great work, The People United relies on the performer’s distinctive interpretation to have its full effect. In fact, there’s an irony here, in that a piece founded on ideals of communality and solidarity should require a high degree of individuality in performance. The Danish pianist Ole Kiilerich gives a performance that is as distinctive as any, and the result is an outstanding success. Kiilerich has an easy-going attitude to the work. His career to date has encompassed as much improvisation as it has classical music, and this comes through in the immediacy and freshness of his interpretation. This forms an ideal balance against Rzewski’s radical politics, and deflects any suspicion ideological dogma. The theme at the opening for example, sounds much more like the folk song that the piece originally was than the protest song it later became. And Rzewski’s subsequent exploration of different textures and colours seems playful and inquisitive, despite the work’s rigorous structuring. Kiilerich goes easy on the more dramatic variations, and his approach never feels overly insistent. He is game for the whistles, shouts and knocks on the piano case, but plays down the theatricality of these effects. The sound quality is good, although by avoiding the absolute extremes of dynamics, Kiilerich make the sound engineers’ job a little easier. The recording is made in a warm acoustic, yet all the detail is clear. In fact, Kiilerich almost always emphasises the flow of the passage work, through flexible legato and careful pedalling, and this too gives the music a sense of warmth. No doubt there will be many more recordings of The People United in the years ahead, and hopefully many more that are as distinctive as this one. Most recordings I have heard up until now have been more consciously virtuosic than this. Kiilerich isn’t interested in that; he’s out to have fun. And the piece proves adept to this approach. It’s not a ‘mainstream’ interpretation, but it’s not one that distorts the music either. For a work that is already very well represented on disc, that’s probably the best way that a further addition can be justified.